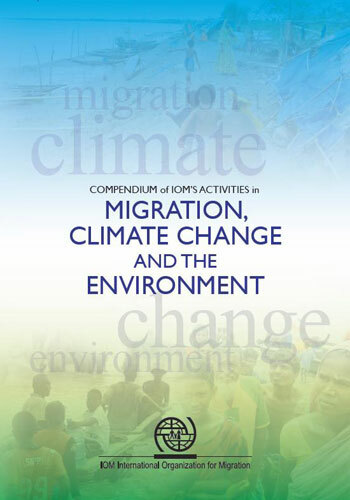 The environment has long played a role in IOM's operational activities as an important push factor of migration. In line with IOM's comprehensive approach to human mobility, a wide range of activities has been developed over the years from preparedness and prevention, response and recovery with the aim of reducing vulnerabilities and managing the risks. IOM's emergency and post-crisis activities do not seek the containment of the affected populations, but aim to provide a viable solution in the aftermath of an emergency and, most importantly, to lay the groundwork for durable solutions. Migration management tools based on IOM's expertise are also used to address long term needs of (potentially) affected populations including by facilitating regular labour migration or by strengthening the links between migration and development. In all its activities, IOM works in close cooperation with local and international partners from different sectors, and operates thanks to the generous contribution of international, national as well as private donors. IOM has long been involved in the response to natural disasters, with its first large operations in 1998 in the wake of Hurricane Mitch in Central America. IOM has become more systematically active in this area since the 2004 Indian Ocean Tsunami. As an illustration, in 2007-2008 IOM has participated in almost all of the 22 flash appeals related to natural disasters. In the same period, IOM carried out more than 60 projects responding to natural disasters in some 20 countries on 3 continents. Funding for natural disasters is making up an increasing proportion of the total funding received under the UN joint appeals (up from a fifth in 2006 to a quarter in 2008). While the growing number of natural disasters requires a more strategic response, IOM's global commitment within this field has helped to position the organization as a leading agency in support of vulnerable and mobile populations affected by the impact of climate change. Assistance is also provided in complex situations where environmental factors are compounded by conflict. Provision of humanitarian assistance on the offset of an emergency and disaster risk reduction are integral components of the work, ranging from life-saving support through provision of non-food items, transitional human settlements, transportation assistance and health care activities to setting up the roadmap for the safe and orderly return and reintegration of the targeted population. IOM operates within the Inter-Agency Standing Committee (IASC) framework maximizing synergies through joint responses. In 2006, in the context of the UN-led Humanitarian Reform, IOM has assumed the strategic role of global cluster lead for Camp Coordination / Camp Management (CCCM) in natural disasters with a responsibility within the IASC to ensure that assistance is provided to the victims. IOM also participates actively in other clusters like emergency shelter, logistics, health, protection or early recovery, and depending on the field presence at a given location, also engages with other clusters in order to provide assistance to displaced population and other vulnerable groups. Community Stabilization is part of IOM's framework of response to prevent further forced migration. Disaster Risk Reduction activities have become an essential part of the stabilization and prevention process, in which IOM works together with governments and communities in order to build resilience to hazards. IOM's strategic interventions are grounded in the understanding that community involvement, including the use of local human resources and materials, is essential in order to stimulate local ownership and safeguard the long-term sustainability of the programmes. As part of the International Strategy for Disaster Reduction IOM also mainstreams environmental factors into its programmes when applying migration management tools in order to prevent and mitigate the negative effects of the movement of people on the environment, especially in cases of mass migration or in the context of emergency shelters / camp management. Community assistance, with community driven capacity building activities that include prevention, rehabilitation support to affected populations, assistance for safe and orderly return and livelihood support programmes. Support to national and district authorities, including national and local Civil Protection structures, to develop, improve and/or maintain systems for hazard mapping, early warning and standard operating procedures, providing capacity building and technical assistance in disaster management and risk assessments. Field studies and assessments of risk, poverty level, perceptions and the community's willingness to engage as well as identification, development and implementation of social infrastructure rehabilitation programmes. Awareness trainings, public information and education campaigns.